1] Body trim: The FED never changed in style, following the Leica look of „wrap-around“ vulcanite moulding without metal trims or borders. 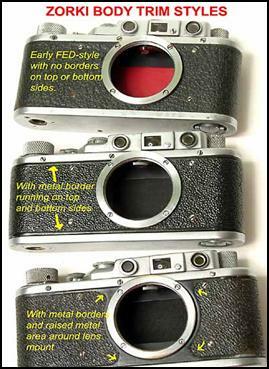 The Zorki had this several ways: first versions were similar to FED and Leica, then followed by a variant with metal borders on both top and bottom sides, and finally, in the last of the Zorki 1, raised metal patterns around the lens mount. 2] Shutter button collars on the FED were first shaped like the one found on the prewar Leica; then these were changed into one with a threaded hole and wide flaring collar (really wide!) during the early 1950s. This came with the change to a simplified shutter speed progression (1/25...etc) too. 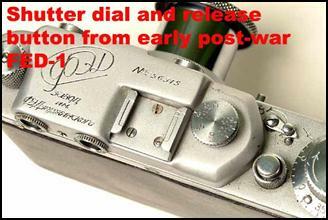 Zorki had the Leica style buttons too, but when it separated from FED, it started sporting a modified shutter button with a threaded hole. This was retained until the last of the Zorki-1. 3] Film spools. Early FED could accommodate Leica spools. But some of their spindles were shaped so that no other but FED spools can fit. Then, when the shutter button changed shaped, the spindles too were changed. From a full spindle which reached to the end of the take-up spool, a modified „short“ spindle which held the spool by friction alone was used. 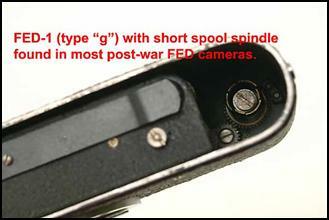 This type of spindle was used by the FED-2 as well. 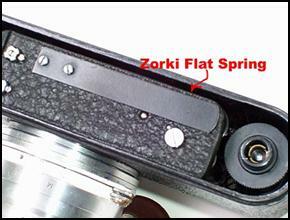 Zorki on the other hand retained the Leica-style full-length spool spindles. They could accommodate most spools: FED, Leica or Zorki. Later Zorki spools were really loose, that they fall off easily. 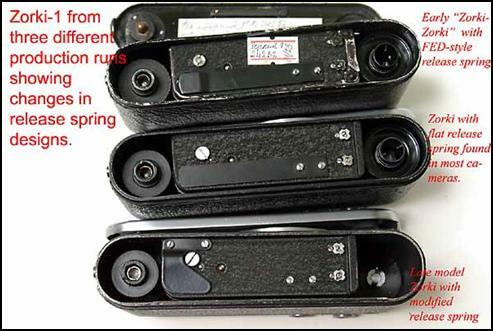 Some people think that this was a defect, but I think this was purposely made so that the last generation spools could fit all Zorki (and Zenit) cameras with removable spools without regard to the spindle designs found in these cameras. I have plastic spools which don't look like the ones commonly found in Zorki or FED. 4] Bottom flat springs. 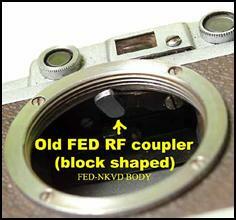 FED retained the design found in its original camera- straight and bent at one end. Zorki had this too in its early versions. Then Zorki redesigned this to a plain flat one. Then finally, they redesigned the spring altogether by making it into a small, plate-shaped one. I think that this is a really brilliant idea since it simplified assembly and disassembly. 5] Pressure plates- FED deviated from the Leica in this regard. Up to the last of the FED-1, the pressure plates were circular in shape. 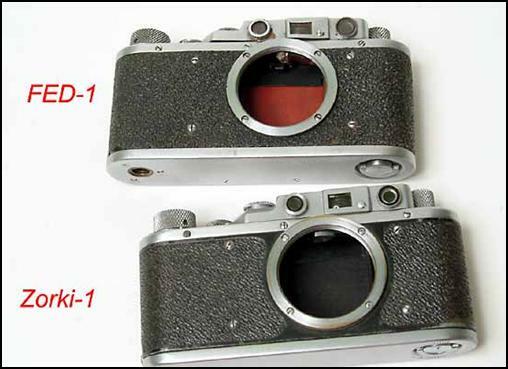 The Zorki originally had these too, but with the 'separation' from FED, they redesigned the plate so that it became shaped like a rather fat 'band-aid' strip similar to the one found in the Leica. 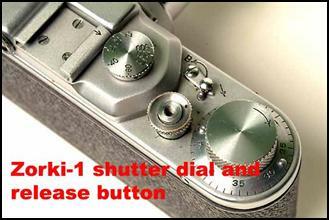 In fact, the Zorki pressure plates could interchange with the one found in the Leica. 6] Rangefinder coupler- FED had this as a little tear-drop shaped sensor for most of its run, used until some FED-2. Some early FED used a rather fat, block shaped sensor. 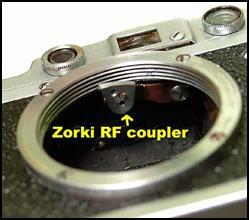 Zorki used the tear drop shaped sensor too in its early incarnations, but was modified to a sloped, pointy one. This shape was to be used not only by all succeeding Zorki, but FED as well. *found on all FED-1 as well, see top pictures. 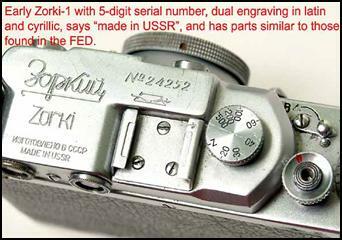 Early Zorki were really FED cameras made by a Russian (FED was Ukrainian) factory. 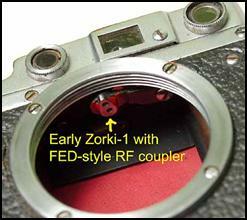 Some Zorki were marked as „FED-Zorki“, are very expensive costing about 5 times an average FED or Zorki would. I've even got an old, 1950 instruction booklet for the Zorki which said, „camera Zorki type FED“. There was a 'separation' sometime after WW2. It was soon after that Zorki started making changes in design. I have two or three early Zorki which have very FED in characteristics. When they first arrived, I thought that they were FEDZorkinsteins, but it turned out that they were early Zorki made by KMZ, still using the FED specs. My 'earliest' Zorki sports a 4 digit S/N and resembles a FED than anything else. They are really FED-Zorki in every respect, except that they were lacking the „FED-Zorki“ label. This label is enough to cost the camera as much as 5 times a nice, regular FED or Zorki....ah, such a difference a little mark makes, doesn't it? Intrigued? Click on picture to read about fake Leicas! Three Zorki release-spring styles from different production runs. 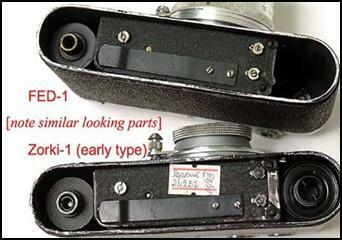 Top, „FED“ style spring and internals similar to FED.Middle, Zorki with flat release spring. Bottom, late model with modified short spring.